Dense texture-based vector field visualization has the goal to show the complete vector field and, therefore, does not miss any important features of a data set. This web page gives an overview of research in GPU-accelerated texture-based flow visualization that allows for interactive applications. This web page contains material of the IEEE Visualization 2004 Tutorial on "Interactive Texture-Based Flow Visualization". Interactive texture-based flow visualization has become an active field of research in the last three or four years. Recent progress in this field has led to efficient vector field visualization methods and, in particular, to improved techniques for time-dependent data. This tutorial covers approaches for vector fields given on 2D planes, on surfaces, and within 3D volumes. Both the theoretical background and the GPU-oriented implementations of many of these techniques are presented, along with a demonstration of their usefulness by means of typical applications. This web page contains additional material accompanying the IEEE Visualization 2003 paper "A Texture-Based Framework for Spacetime-Coherent Visualization of Time-Dependent Vector Fields" by Daniel Weiskopf, Gordon Erlebacher, and Thomas Ertl. This web page contains additional material accompanying the paper which introduces orthogonal vector field visualization on 2D manifolds: a representation by lines that are perpendicular to the input vector field. Line patterns are generated by line integral convolution (LIC). This visualization is combined with animation based on motion along the vector field. This web page contains additional material accompanying the Graphics Interface 2004 paper "A Hybrid Physical/Device-Space Approach for Spatio-Temporally Coherent Interactive Texture Advection on Curved Surfaces" by Daniel Weiskopf and Thomas Ertl. This web page contains additional material accompanying the Eurovis 2005 paper "Real-Time Advection and Volumetric Illumination for the Visualization of 3D Unsteady Flow" by Daniel Weiskopf, Tobias Schafhitzel, and Thomas Ertl. This web page contains additional material accompanying the IEEE Transactions on Visualization and Computer Graphics paper "Texture-Based Visualization of 3D Unsteady Flow by Real-Time Advection and Volumetric Illumination" by Daniel Weiskopf, Tobias Schafhitzel, and Thomas Ertl. 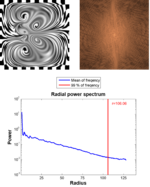 This web page contains additional material accompanying the IEEE Transactions on Visualization and Computer Graphics paper "Output-Sensitive 3D Line Integral Convolution" by Martin Falk and Daniel Weiskopf. This web page contains additional material accompanying the International Symposium on Flow Visualization (ISFV14 2010) paper "Trajectory-Augmented Visualization of Lagrangian Coherent Structures in Unsteady Flow" by Martin Falk, Alexander Seizinger, Filip Sadlo, Markus Üffinger and Daniel Weiskopf. This web page contains additional material accompanying the Vis 2005 paper "Texture-Based Visualization of Uncertainty in Flow Fields " by Ralf P. Botchen, Daniel Weiskopf and Thomas Ertl. This web page contains additional material accompanying the Eurovis 2012 paper "Visualization of Advection-Diffusion in Unsteady Fluid Flow" by Grzegorz Karch, Filip Sadlo, Daniel Weiskopf, Claus-Dieter Munz, and Thomas Ertl. This web page contains additional material accompanying the Workshop on Vision, Modeling & Visualization (VMV) paper "Spectral Analysis of Higher-Order and BFECC Texture Advection". This web page contains additional material for this article, published in Computing in Science & Engineering 2013. Netzel, Rudolf; Weiskopf, Daniel: Texture-Based Flow Visualization. In: Computing in Science & Engineering: Ausgabe 15, Nr. 6 (2013), S. 96-102. Karch, Grzegorz K.; Sadlo, Filip; Weiskopf, Daniel; Hansen, Charles D.; Li, Guo-Shi; Ertl, Thomas: Dye-Based Flow Visualization. In: IEEE Computing in Science and Engineering: Ausgabe 14, Nr. 6 (2012), S. 80-86. Karch, Grzegorz K.; Sadlo, Filip; Weiskopf, Daniel; Munz, Claus-Dieter; Ertl, Thomas: Visualization of Advection-Diffusion in Unsteady Fluid Flow. In: Computer Graphics Forum: Ausgabe 31, Nr. 3 (2012), S. 1105-1114. Netzel, Rudolf; Ament, Marco; Burch, Michael; Weiskopf, Daniel: Spectral Analysis of Higher-Order and BFECC Texture Advection. In: Workshop on Vision, Modeling and Visualization (VMV), S. 87-94, 2012. Falk, Martin; Seizinger, Alexander; Sadlo, Filip; Üffinger, Markus; Weiskopf, Daniel: Trajectory-Augmented Visualization of Lagrangian Coherent Structures in Unsteady Flow. In: International Symposium on Flow Visualization (ISFV14), 2010. Bachthaler, Sven; Weiskopf, Daniel: Animation of Orthogonal Texture Patterns for Vector Field Visualization. In: IEEE Transactions on Visualization and Computer Graphics: Ausgabe 14, Nr. 4 (2008), S. 741-755. Falk, Martin; Weiskopf, Daniel: Output-Sensitive 3D Line Integral Convolution. In: IEEE Transactions on Visualization and Computer Graphics: Ausgabe 14, Nr. 4 (2008), S. 820-834. Weiskopf, Daniel; Schafhitzel, Tobias; Ertl, Thomas: Texture-Based Visualization of Unsteady 3D Flow by Real-Time Advection and Volumetric Illumination. In: IEEE Transactions on Visualization and Computer Graphics: Ausgabe 13, Nr. 3 (2007), S. 569-582. Botchen, Ralf P.; Weiskopf, Daniel; Ertl, Thomas: Texture-Based Visualization of Uncertainty in Flow Fields. In: Proceedings of IEEE Visualization '05, S. 647-656, 2005. Weiskopf, Daniel; Schafhitzel, Tobias; Ertl, Thomas: Real-Time Advection and Volumetric Illumination for the Visualization of 3D Unsteady Flow. In: Proceedings of EG/IEEE TCVG Symposium on Visualization Eurovis '05, S. 13-20, 2005. Weiskopf, Daniel; Ertl, Thomas: A Hybrid Physical/Device-Space Approach for Spatio-Temporally Coherent Interactive Texture Advection on Curved Surfaces. In: Proceedings of Graphics Interface 2004, S. 263-270, 2004.